You have pain and cancer; your doctor reaches for his script pad and orders: 7,8-didehydro-4,5-epoxy-17-methyl-(5α, 6α)-morphinan-3,6-diol. Morphine. A widely and commonly used opiate, it is in fact the earliest of painkillers, isolated in 1803 by Sertürner. It is today still the most commonly used pain killer. But besides trying to alleviate your pain what is it doing to your cancer? Scientist have known for years morphine increases the rate of tumor growth and the rate of migration of cancer cells causing an increased amount of metastases. Ever notice when cancer patients begin morphine they seem to get worse? And the morphine is increased due to the increase of cancer pain; more cancer, more pain until the vicious cycle ends in a funeral. A study done with rats showed carcinosarcoma cells produced subplueral pulmonary metastases when they were given morphine, the number of metastases increased. If given Naloxone they discovered the metastases proliferation could be decreased. Unless in a controlled study humans are not given the luxury of naloxone; therefore standard dosage is given regularly and the increase of metastases is an everyday occurrence as we much as we can assume. In further studies they noted mice given morphine showed marked atrophy and a reduced amount of cellularity of the spleen and thymus demonstrating the immune system is greatly affected using morphine. The studies researched all noted data collected suggests morphine enhances tumor growth and results in an overall immunosuppressive effect. Most scientist studying the use of morphine in cancer patients conclude, morphine can promote tumor growth and reduce the survival rate of cancer patients due to immunosuppression. Furthermore, cancer cells by majority have the ability to migrate, called metastases, they settle in surrounding or distant sites; most cancer deaths occur not from the primary cancer site but the main cause of ‘failure’ in cancer treatments is due to the metastases. In a study done by Shapiro in 1996 showed that uPA levels regulated by cancers were affected when morphine was administrated. The uPA levels in vitro demonstrated morphine caused marked increase of the secretion uPA in breast cells. A scan shows metastases in the hip and spine; the doctor prescribes morphine to one woman; her pain increases over some weeks and the morphine is increased. Desperate and afraid to die she sought treatment in a remote clinic. There a new scan was done, just weeks after her scan revealed some bone mets. The astonishing new scan revealed her cancer had spread significantly to nearly 80 percent of her body. The only medication given was morphine. The woman so shocked, stopped the morphine, underwent her new treatment and reported that her pain had decreased by nearly 90 percent. Pain during treatment of cancer where the patient is not considered in a death watch should not be given morphine or the direct result could be lack of survival. I am shocked about the morphine my daughter drink a lot when she was on chemo. My only question is why oh why do we have opiate receptor cells in our brain, almost as if to trick us into its validity? I’m confused, Damon. Have you come across any credible sources not found online? We have had numerous doctors and nurses come to us with this same information. This is peer reviews of their experience and in the world of science since it is not controlled it is often discounted; however if one is considering this medication it is good to know there are peer experiences as well as research that shows it might not be the wisest choice if the treatment you are undergoing may bring you into remission, Another medication might be far more helpful. It is always, I repeat, always the choice of the patient to make the ultimate decision. A person’s Ph levels are important. I have heard some pretty wild success stories from cancer patients using a combination of cannabis and this new/ancient substance called Ormus, and Mono-atomic minerals broken down to a level that is readily usable by the body’s digestive system. I too have heard that ph levels are important. I heard of a Dr. in Italy who uses baking soda as part of treatment. 1 tbsp baking soda mix w/a half cup of warm water then sweeten it up w/ honey or a strong sweetener. ( cancer cells consume 15 times the sugar than any other cells in your body ) drink this twice a day for 30 days then 1 time a day after that. (check YouTube – baking soda and cancer. A friend of mine did it and saw a reduction in the size of his tumor!!! Incredible!!!!! pH is very important however just balancing pH will not cure the disease. Studies not a reduction in tumor growth or tumor size; rarely is there mention of tumor elimination or disease elimination, this is what people want. People want to live, we need full longterm remissions. This is clearly a complex question, and whether to receive morphine for cancer pain should always be a personal, careful, informed choice between each patient and their doctor. That there is a wide variance in the research is a critical fact you left out of your article. (Not to mention that multiple studies show tumor inhibition, not growth.) As cancer patients we can’t make informed decisions with only half the facts. Yes it is a complex issue and the decision to use morphine or a morphine based pain medication is not to be taken lightly. If there are other things that can be used to alleviate the pain that might be considered should your cancer case be in a stage where further treatment could give you remission. A well advanced cancer sufferer might consider using morphine if there has been an acceptance there is nothing more to be done and heavy amounts of chemo and radiation has given painful side effects as well. No two cases are alike and no two decisions are the same. If you know this, why doesn’t the medical industry know it ? Or is that a silly question ? Jeff, not such a silly question. Based on the fact our sources were from medical scientific reports, we would hope doctors would read; fact is most doctors say they don’t have the time to read most studies therefore, therein is your answer. The research end of the medical industry knows it; the other end of the medical industry has a deaf ear to it because they are too busy, the information that is critical never reaches the decision makers. You suffer the consequences. We actually don’t know that this is true. You link to one article and four abstracts as sources. Three of the abstracts are very specific to certain opioids and certain cancers in mice, not humans. The one link about humans (bone cancer) doesn’t show increased cancer growth, but can lead to bone loss and increased pain for the patient (according to the abstract). But because they are behind a paywall (in some cases) I can’t see any relevant info, such as sample size, duration, methodologies, that might help evaluate the efficacy of the studies. The article is refuted by the link here – http://www.geripal.org/2009/11/does-morphine-stimulate-cancer-growth.html Your last link is malformed so it doesn’t go anywhere. Skeptic, the link you noted was fixed, an upload glitch. The article you supplied was written by someone that did not do their homework; had they looked into scientific reports they would have noted the many studies that have been done over the past near two decades to indicate morphine at a normal dosage given to most cancer patient is sufficient to increase tumor growth and increase metastases. You mentioned that most of the studies were done with mice. It would be hardly human if there was a double blind study done to see if giving morphine to one group would make their cancer increase to a point where they would not survive; the other group given some other form of medication to see how they fared. Would you want to be in the trial? In these case studies it ethical to use mice or rats. As you may see in the scan report we included, this particular patient had a scan done shortly prior to the scan included; the only change was adding morphine to her regiment. There was a dramatic increase in cancer metastases during that time period. If there is another method of killing pain in a patient that still has hope to survive why not use it? If you are a skeptic, would it not be wise to err on the side of caution rather than to take a risk? Could it be possible that this particular patient had a progressing cancer and therefore the scans showed disease progression? I’ve read the supporting articles and this article is jumping to some pretty hefty conclusions. The patient that was used in the article had the progression over a short time – before this, her cancer progressed a rate that would be considered typical for her lung cancer; the progression after going on morphine was 10 fold; it grew rapidly. Before her scan showed about three small spots on her spine and a couple on her ribs. After a short time she complained of more pain and another scan showed more rapid growth, she increased the morphine and shortly thereafter the couple looked for treatment outside the conventional arena. 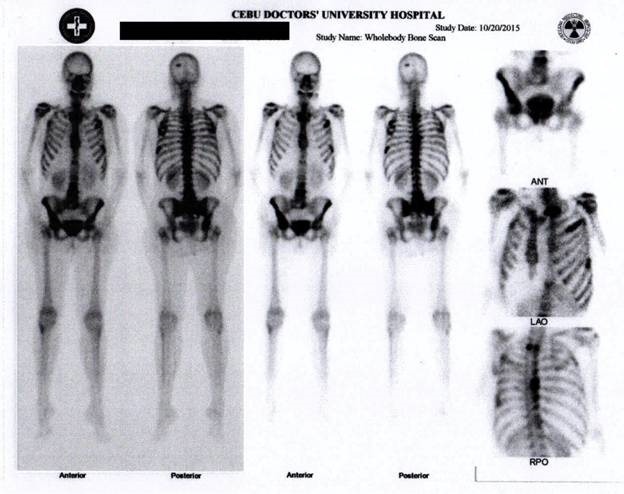 Her scan as shown was taken once she arrived in Asia. Even the conventional doctors agreed her metastases was excessively aggressive and her dose of morphine was near a lethal dosage. She has since had further scans and her cancer is now nearly undetectable. She is still undergoing treatment for her complaints. If people want to be skeptical they need to do more due diligence. There are a dozen more studies we did not use, all reiterating the same conclusion. While a patient in their last days deserved to use morphine to give them some peace, if they are in pain. But to use it while treating cancer in hopes of survival for the patient is not justified, like putting on the gas and brakes on you car at the same time – not going to work. I’m not being cheeky here, just wonder ….if a person is reaching their demise, why would they want something to increase their pain? What treatment in what remote clinic? This article is not very forthcoming with the alternative treatment that is so miraculous but apparently can’t be revealed. Helen, if you want to know more in that regard kindly get hold of a staff member at Jesicha’s Hope – info@jesichashope.org. They will help you with the information you want. The article was to focus on the topic of morphine and what it can do to cancer growth therefore taking the focus off that topic to discuss how she is being treatment would not have fair to the topic. So what analgesic or pain control med can you give to cancer patients? I have been on an increasing dose of tramadol for 3+ years, for neck and back pain. It’s worked very well, but I’ve reached maximum dose of 400mg per day. I’m being taken off tramadol and have been prescribed Norspan, a morphine patch of 5mg. I’m a 55 year old just wanting relief from constant pain ! I’m a bit concerned now that it could be doing Me more damage than good??? Whats Your opinion of apricot kernels as a treatment ?? I was pretty glad to hear you recommend Tramadol because I take that and I am in chemo. I always suspected it because it’s a manmade kinda thing, but I like it. A therapist told me people take it for anxiety, but really paid, in her biz, although it’s ‘off-purpose’ or whatever that term is… It gives me great energy, and I just feel good. I take 3 or so a day. Thanks! If you can point me to any more info I would appreciate it. I like it also because one doesn’t have to go through all that rigamarole to get it. Yes cannabis oil is good for pain and has been used for centuries for pain. This is one of the best uses for cannabis. We are not so convinced it is a cure; it can kill but not seeing those miraculous cures as everyone talks about. Lots of pain going away and appetite occurring, not so much the miracle cure. Indeed, cannabis for pain. That treatment is surely out of the dark ages of cancer treatment. Ove the last nine days I’ve tuned into the docu-series ‘The only anser to Cancer’ The quest for the cures, the final episode #9, the most awesome testimonies, it has got to be seen by the whole world, especially those that conventional medicine is not helping. Cancer doe snot have to be a death sentence, belive it, it is true. Good luck in your quest. Look up Michael McShane. He cured skin cancer on his face and yes it did cure. Also check out Lynnice Wedewer. She has used it for several bouts of cancer over decades and is also using it right now. Email us and we will get you some expert help.